There’s always more to do around here than time to do it — whether it’s getting the lawn mowed, or the garden weeded or maybe even checking out a festival or two. One of the great things we want to do with the new website is post up information about what’s going on in the area so you don’t miss a thing. Unless you want to, of course. It’s taking a while to get the timing right but we’re just gonna start and see where we end up. Either way, posting this up means I get out of weeding, so it’s all good! OK, I was sure this happened over Labour Day, but the annual Dragon Boat festival is going on right now in Wascana Park. That’s Saturday August 23rd. We’re not sure why it’s early but it is. They’re kind of hiding this year, with races taking place over on the Broad Street side of Wascana Park and concessions and kids activities tucked in beside the Marina. But it’s a nice day so get out there and cheer! Big Stuff, Little Stuff, Cheap Stuff. Garage Sales!! 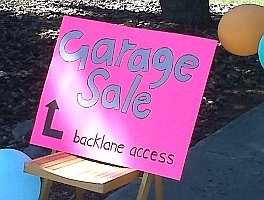 It looks like the folks on 2800-2900 block Queen Street got organized and are having a block long garage sale! Lots of kids clothes, art, odds, sods, bric and brac. Don’t even try to resist the urge — go check it out! Mozart? You mean Leonard Mozart from Strasbourg, right? I think the reason the Dragon Boats are tucked around the corner this year is there are some HUGE tents getting set up by the Royal Saskatchewan Museum. It’s all for Mozart in the Meadow, put on by the Regina Symphony Orchestra which runs Sunday in Wascana Park. Get your Classical Groove on tomorrow! Our roving reporter Kelly received a letter from the Multiple Sclerosis Society yesterday. They are looking for volunteers for their Clean Up Canvassing Crew, to cover the city on September 27. With your help, they can raise money for MS research and raise awareness about Multiple Sclerosis. They are only looking for a 1-2 hour time commitment. Please call Taralee Houston at 522-5600 or at taralee.houston@mssociety.ca by August 15 to sign up! Welcome to the new site. It was created on August 4, 2008 and we’ll be getting more information up and running in the coming weeks. If you’re the type of person who is interested in what’s going on in Southwest Regina, this is the place to be! Please subscribe to site updates in the handy box on the right and we’ll you’ll get all the best info right in your inbox or reader.